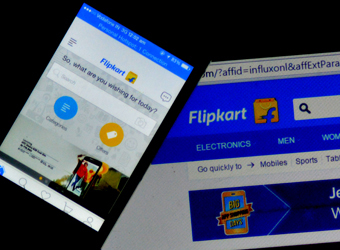 Fidelity Rutland Square Trust II, the mutual fund managed by Fidelity Investments, has lowered the value of its investment in Flipkart by 36.1%, valuing the e-commerce marketplace at $5.56 billion, nearly a third of its peak valuation of $15.2 billion in 2015. According to filings with the US Securities and Exchange Commission (SEC), the American mutual fund has marked down the value of Flipkart shares it owns to $52.13 per share as of November 2016 from $81.55 for the quarter ended in August last year. Morgan Stanley, another mutual fund investor, had valued Flipkart at $5.57 billion in September 2016. This is the third time Fidelity has reduced its valuation of Flipkart. The fund had slashed the value of its investment in the company, for the second time last year, when it readjusted the share value to $81.55 for the quarter ended in August from $84.29 in May, valuing the e-commerce giant at $8.71 billion. In the first instance of its markdown, Fidelity Investments lowered the value of Flipkart shares by almost 40% to $82 apiece as of 29 February 2016 from $135.8 in August 2015, valuing Flipkart at $8.80 billion. The fund had, however, hiked the value of its shares by 2.8% to $84.29 apiece at the end of May last year from $82 three months earlier, just two months after it initially lowered the share value. Quarter after quarter, US mutual funds that have invested in Flipkart marked down the valuation of Flipkart shares. In total, Flipkart suffered more than a dozen successive markdowns from mutual fund investors including Morgan Stanley, Vanguard, T. Rowe Price and Valic over the course of the past one year. The most recent valuation markdown was from T. Rowe Price, which has reduced the value of its investment in Flipkart by 4% to $93.15 in the quarter through December 2016 from $96.29 during the September quarter, valuating the company at about $9.9 billion, The Economic Times had reported. Fidelity first invested in Flipkart in 2013 during the company's Series D round. In a major organisational restructuring in the second week of this month, Flipkart appointed Kalyan Krishnamurthy, a former Tiger Global executive, as its new chief executive officer and made Binny Bansal group CEO. The top level shuffle, which comes exactly a year after co-founder Binny Bansal was made CEO, signals that the company is still striving to set the house in order even as it fights a tough battle against Amazon in online retailing. Under Bansal's helm, the company was seen struggling while dealing with successive exits of top-level executives, multiple rounds of valuation markdowns and a funding drought besides slow volume growth. The company that saw a strong churn among senior leadership ended 2016 with a few more exits. Flipkart's other investors include Tiger Global Management, Naspers, Accel Partners, Iconiq Capital, GIC, DST Global and Sofina Societe.